How exactly do you define “long run”? Are you sure you’re the exceedingly rare type of person who can watch the stock market lose money for more than a decade without changing course? Even if your own portfolio is doing well, do you react to other portfolios outperforming your own for several years in a row with confident apathy or with tinkering envy? Can your personal life goals like college or retirement really be put off for years while waiting for the “long run” to circle back around? The “long run” means different things to different people, and most people would be well served by thinking about their own goals and needs and selecting a portfolio based on more than just the long-term average return. Beyond the length of time, what about the start date? Thirty years may seem like a nice long-term sample, but does looking at the average return starting only in the front end of one of the largest stock bull markets in history really tell the full story? 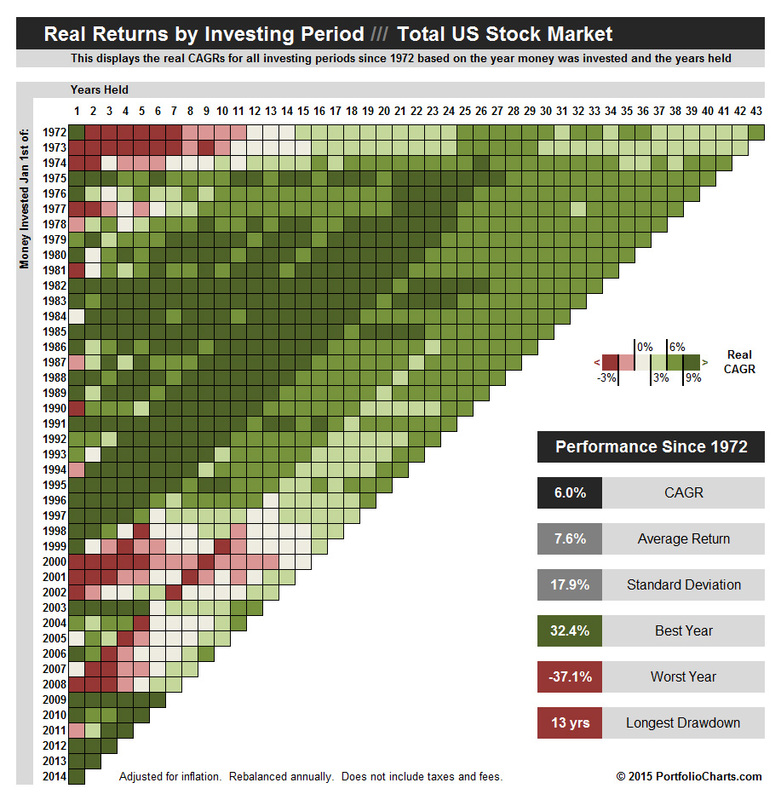 How did the same portfolio perform starting in the high inflation 70’s or the volatile 2000’s? Are you really looking at the big picture, or just a single snapshot that confirms what you want to see? To help evaluate what the “long run” means to you, I’ve updated the Pixel Calculator to display the same full history as the charts you see on the portfolios pages. For those seeing the Pixel chart for the first time, it displays the real (inflation-adjusted) compound annual growth rate for a given portfolio over every investing timeframe since 1972. The rows are the start years, and the columns are the years held. So to look up an individual investing period like the ten years starting in 2000, you first find “2000” on the left side and read over to year ten. In the above example, the pixel color indicates that the real CAGR over that timeframe was between 0-3%. For those looking for a more specific number, you can see that it’s 0.38% by hovering your cursor over that cell in the active calculator. This chart is useful for a wide variety of portfolio evaluation applications. To see every real CAGR over a 30-year duration, read down the “30” column. To see the real return in every individual year, read down the first column. Perhaps most importantly, to get a glimpse of the overall performance of the portfolio in a variety of economic conditions, look at the chart as a whole and consider the highlighted “Performance Since 1972” stats. Setting aside the long-term average return for a moment, just how much red will you be able to tolerate in real life, and for how long? Returning users will note that some of the previous data has been removed in favor of other stats. If you find yourself missing that information, try the Funnel chart — it contains all of the same data and more. And for the colorblind readers out there who look at the picture above and have no idea what I’m talking about, there’s also a colorblind friendly version. I strongly believe that selecting the right portfolio for your individual situation requires not simply banking on the “long run” results, but also looking at the big picture. Hopefully by making the Pixel chart just a little bit bigger, that picture will come even more into focus. UPDATE: Since this article was first published, the calculator has been renamed from Pixel to Heat Map.